Vancouver, British Columbia--(Newsfile Corp. - November 27, 2017) - SilverCrest Metals Inc. (TSXV: SIL) (OTCQX: SVCMF) ("SilverCrest" or the "Company") is pleased to announce additional Phase II drill results for the Las Chispas Property (the "Property") located in Sonora, Mexico. Step-out drilling targeting extensions of the Babicanora Vein continues to intersect high-grade mineralization. 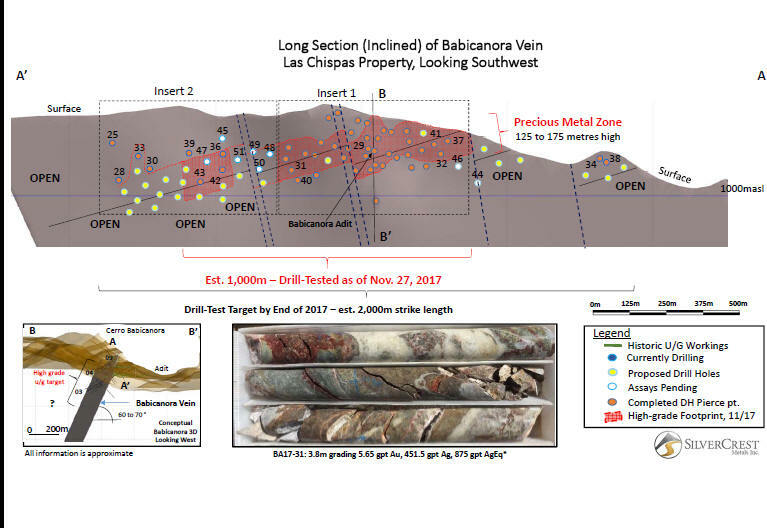 With the latest results, SilverCrest has drill-tested and intersected high-grade mineralization for an additional 400 metre of strike length at the Babicanora Vein. The high-grade footprint is now a total of 1,000 metres in strike length, with a near-surface mineralized height of 125 to 175 metres (see attached Figures). There are 19 known epithermal veins on the Property, including nine which consist of the Babicanora, Babicanora Footwall, Las Chispas, Giovanni, La Blanquita, William Tell, Varela, Granaditas and Amethyst veins. SilverCrest has intersected high-grade silver-gold mineralization in each of the nine veins drilled to date. N. Eric Fier, CPG, P.Eng, President and CEO, remarked, "Our continued step-out drilling along the strike of the Babicanora Vein has added another 400 metres to the previously announced high-grade footprint, bringing the total strike length to one kilometre. 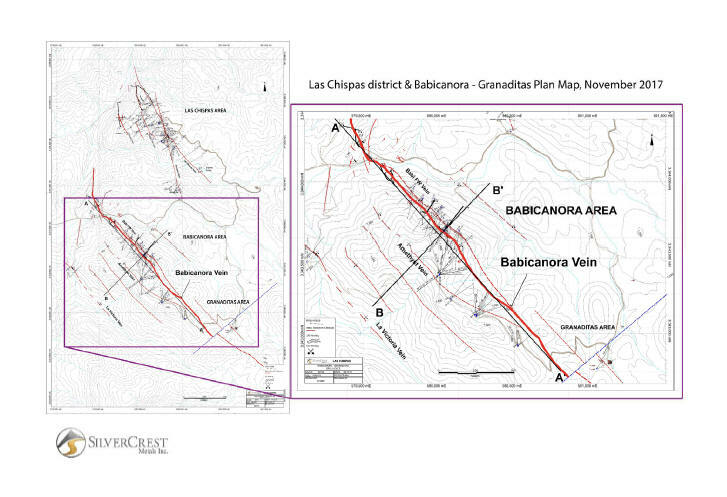 The Babicanora Vein has clearly developed into the most significant source of high-grade mineralization in the district. We are planning an additional 10 to 15 surface holes at the Babicanora Vein to infill recent results and test for further extensions before mid-January 2018. In addition, we will continue underground drilling at the Las Chispas and Giovanni veins. Drilling to date has intercepted areas of high-grade mineralization in all targeted veins, warranting further drilling to better define continuity and volume. We remain on track to complete our expanded Phase II program by mid-January 2018 in anticipation of releasing a maiden resource estimate for the Las Chispas Property in February 2018." Drill holes BA17-25, 28, 30, 34, and 39 intercepted anomalous mineralization, but are below the Company's 150 gpt AgEq cutoff. Hole BA17-35 was drilled in the Amethyst Vein with results pending. Hole BA17-40 intercepted 0.10 gpt gold and 117.8 gpt silver or 136 gpt AgEq, which suggests a lower grade halo adjacent to the high-grade footprint. 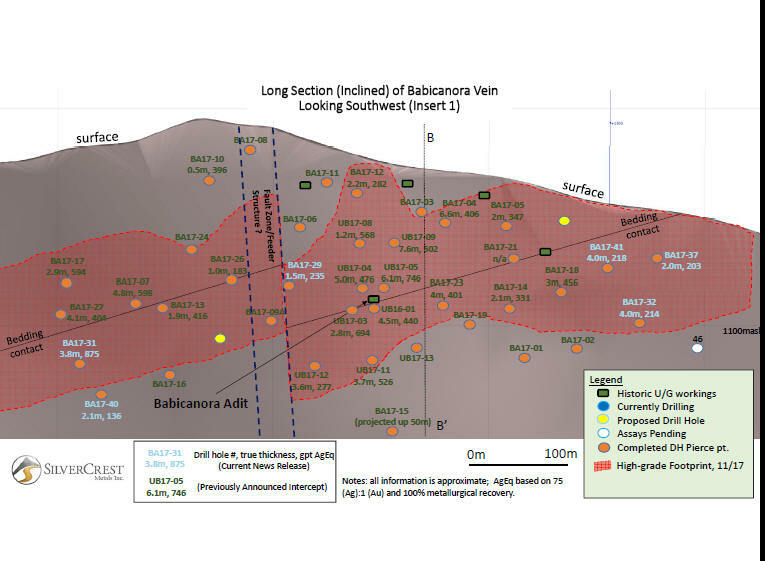 With this recent set of results, the revised estimated high-grade footprint of the Babicanora Vein is now one kilometre long and is open along strike and potentially down dip. 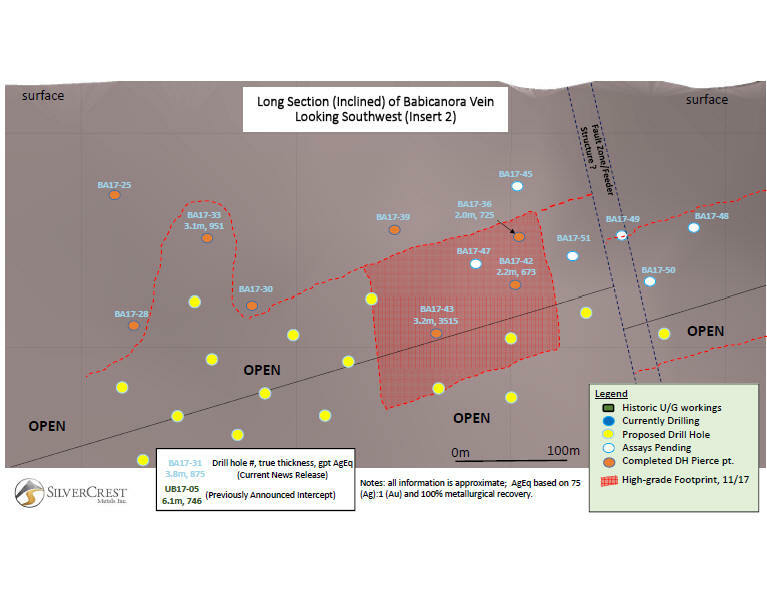 The Company continues to intersect mineralization in the Babicanora FW Vein, as previously announced. This vein is parallel and located 20 to 30 metres to the northeast of the Babicanora Vein. The known surface strike length of this vein is over one kilometre long. These results will be provided in a separate news release. The Company plans to continue with step-out and infill drilling with an additional 10 to 15 surface holes to be completed on the Babicanora Vein and ongoing underground drilling on the Las Chispas and Giovanni veins. Furthermore, the Company continues to collect trench samples from the surface dumps. The expanded Phase II program will be concluded by mid-January 2018, in time for results to be incorporated into the maiden resource estimate in February 2018.